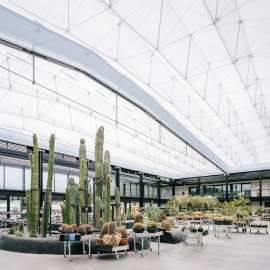 Desert City is a multi-functional complex dedicated to the celebration of xerophyte plants and the production of a broad culture of interests focused on these species. It promotes a landscape/cultural program that defends dry or waterless landscaping as necessary in a semi-desert climate like that of southern Europe. 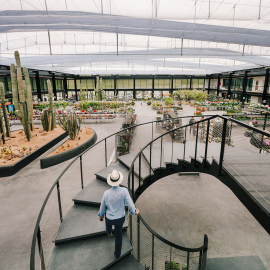 The project is a sustainable and ecological complex that houses overlapping activities, ranging from the exhibition, reproduction and sale of cacti from around the world, in a large garden and covered greenhouse, to activities such as educational workshops or plant exhibitions. It also enfolds a significant commitment to R&D, undertaken in collaboration with international universities. 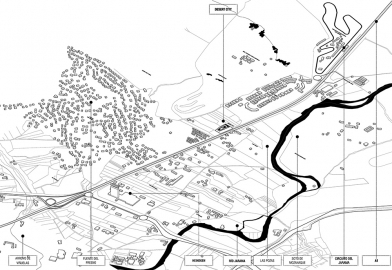 The Desert City plot is located in a transition space: on one side it borders the edge of the A-1 highway and, on the other, it runs up against the foothills of the Cuenca Alta del Manzanares Regional Park. 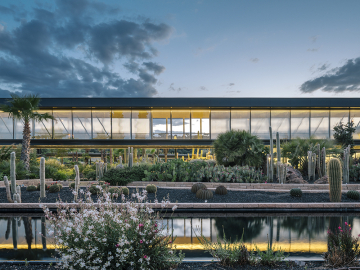 Its location along this border, isolating itself while also connecting two separate realities, suggests the metaphor of an oasis – a logical cultural reference in a place dedicated to growing cacti. 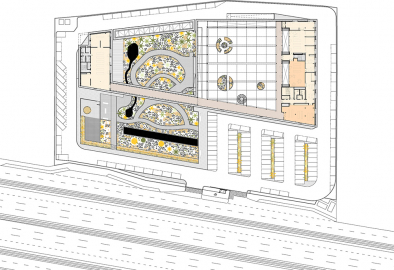 That metaphor becomes operative, as it suggests organizing the building in an introverted way, facing toward the garden’s open interior, which is surrounded by the building that protects it, and toward the nursery, which is also protected. 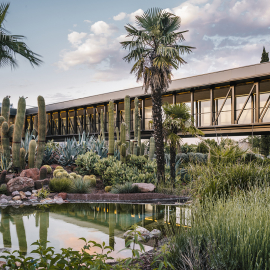 It is easy to understand Desert City as the creation of two oases on the original plot: the open-air garden/nursery; and the covered greenhouse. The Plot was originally an open field, piled with up to 4 m. of debris from the successive enlargements of the A-1 highway. Through a regeneration process it is partially returned to nature, creating a paradoxical landscape that is both natural and artificial at the same time; exotic and atavistic. 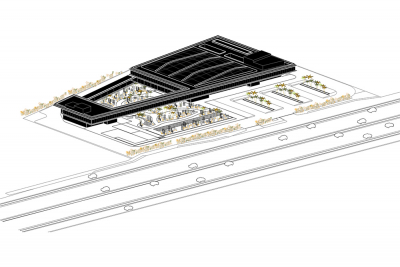 The program is combined into a single lightweight construction that responds to the nearby presence of the A-1 highway. 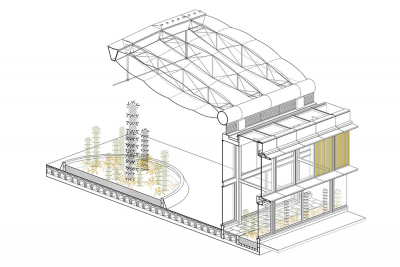 A linear single volume, parallel to the road, is organized internally by the symmetry between the garden and the greenhouse. 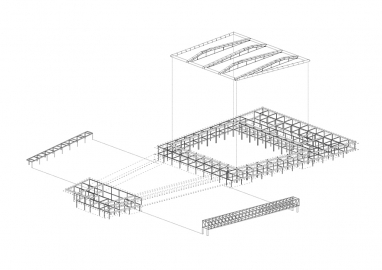 The latter is protected by a light roof made using a tensegrity-type tensile cable structure, covered by a double-layer Etfe cushion system that mitigates variations in temperature. 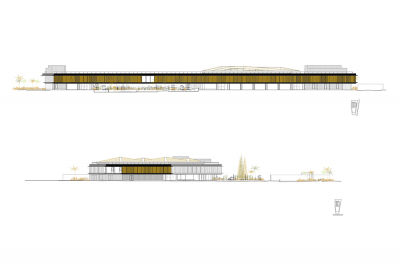 The project relies on certain organizational constants (courtyard, cloister, bridge), and the formal grammar is based on the modulation and systematization of an exposed metallic structure covered in coloured glass. 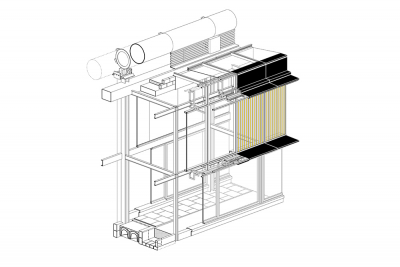 The combination of these typological and constructive resources is guided by the general filter of an energetic and environmental criterion, so that the whole can coordinate active and passive devices like double façades, courtyards, cross ventilation, geothermal energy, solar protection, etc., which are evident in the building’s use but not in its form.